Today’s Follow Friday is Chris Adkins, someone you may already be familiar with, who has recently become a large presence in today’s woodworking community. Along with Dyami Plotke and Tom Iovino, Chris has helped bring a new following to woodworking as a founder of the Modern Woodworkers Association, an online community founded in 2010. The MWA was started “as a way to organize woodworkers participating in online communities, help spread the word about the network of woodworkers and the knowledge they share, help connect people, who share a love of the craft both online and off, and build a framework for growing the craft for the future.”-MWA Website. In our April Wood News, we featured Chris in our popular Show Us Your Wood Carving column. Chris is a third generation woodworker based in Atlanta, GA, whose “day job” is a general contractor. Although he doesn’t call himself a wood carver, his beautiful Tree Box (seen below) begs to differ. 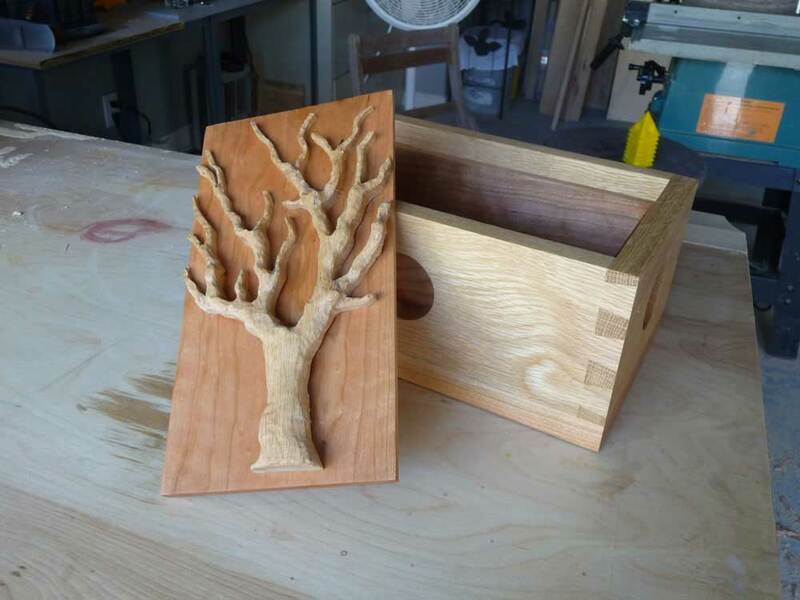 This project started out as just a 1 day box project that he was making to practice his dovetail cutting, and then he decided to add the tree carving at the very end. The tree design was cutout with a scroll saw and then carved through a combination of hand carving and a Dremel Tool with a carving bit attachment. Paul Sellers, lifestyle woodworker and Founder of the New Legacy School of Woodworking, mentioned Chris and the MWA in one of his blog posts about a recent visit he made to Atlanta. Click HERE to read the blog and more about Paul Sellers. While he was in town, Paul even participated in one of the popular Modern Woodworkers Association’s Podcasts, where he and Chris discussed his work, his background, and how to get younger people involved in woodworking. To find out more information about Chris Adkins, you can visit his High Rock Woodworking website HERE. His website features lots of great links to articles, videos, and projects on all things woodworking. Follow Chris’s individual Twitter HERE, and the Modern Woodworkers Association HERE. 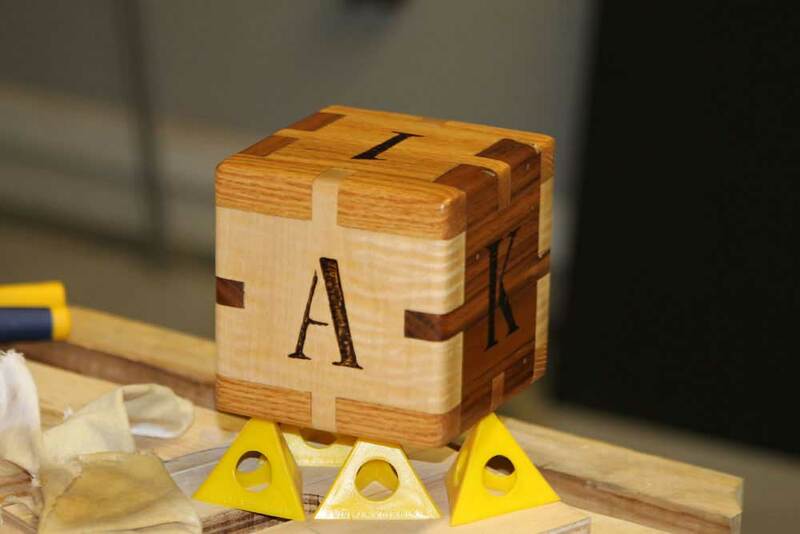 ABC Cube made of Maple, Oak, and Chestnut, that also acts as a rattle. The Down to Earth Woodworker: Some Thoughts for Woodworking Safety Day Don’t Forget Your Toothbrush!